The Health and Safety Executive (HSE) has revealed that construction workers are at a high risk from breathing in dust. 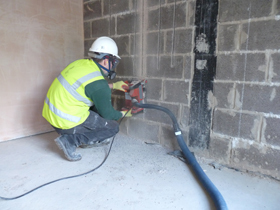 In response to the dangers of dust consumption, the industry has launched the Construction Dust Partnership – a network of partners committed to tackling the issue – supported by HSE. The partnership brings together key stakeholders across the industry with representation from manufacturers, suppliers, contractors, designers, training bodies and workers. They plan to raise awareness, drive improvements forward and encourage behaviour change through joint initiatives. Projects to date include a series of toolbox talks, road shows, posters, and educational resources which are available to access at a dedicated section of the CITB website. Construction dust includes silica, wood and other dusts. The inhalation of these hazardous particles can result in severe respiratory illnesses such as occupational asthma and lung cancer silicosis. Currently, over 500 construction workers are believed to die each year as a result of dust exposure.